So Christmas is over, and that means a return to reality… mine is coming in the form on Uni work and impending deadlines. I haven’t worn any makeup for a week, because I haven’t been going anywhere! I have also been living in my jammies, but surely that is the very essence of Christmas? For me it is. My week of makeup free skin has also coincided with a week of hideous hormonal breakouts. Every month I get angry red spots on my chin. They’ll lurk under the surface for a day or so and then appear, and refuse to leave for at least a week. Sigh. Every day I’ve been slathering on the Origins Out of trouble ten minute mask just on my chin, and so I look like I have a white Santa’s beard. Silver linings… This mask is the best for breakouts, it really helps to reduce them I think! At night I’ve been using the Malin & Goetz acne treatment on my blemishes. (Current count is 5) This stuff is really quite potent. I think having used it most nights it has dried out my skin a bit, but it has also dried out the spots. Hmm. The best spot treatment for overnight drying and reducing. To make up for the dryness I have also been using the Kiehl’s midnight recovery concentrate every night, and my skin drinnnnks it up. Lovely stuff. I wake up with soft and nourished skin, and my cheeks seem a bit less red. Mmm. 2 more moisturising products, because why not? The Dior creme de rose lip balm has been the only things I’ve smeared on my lips all week. It’s creamy, hydrating and smells like roses. J’adore. 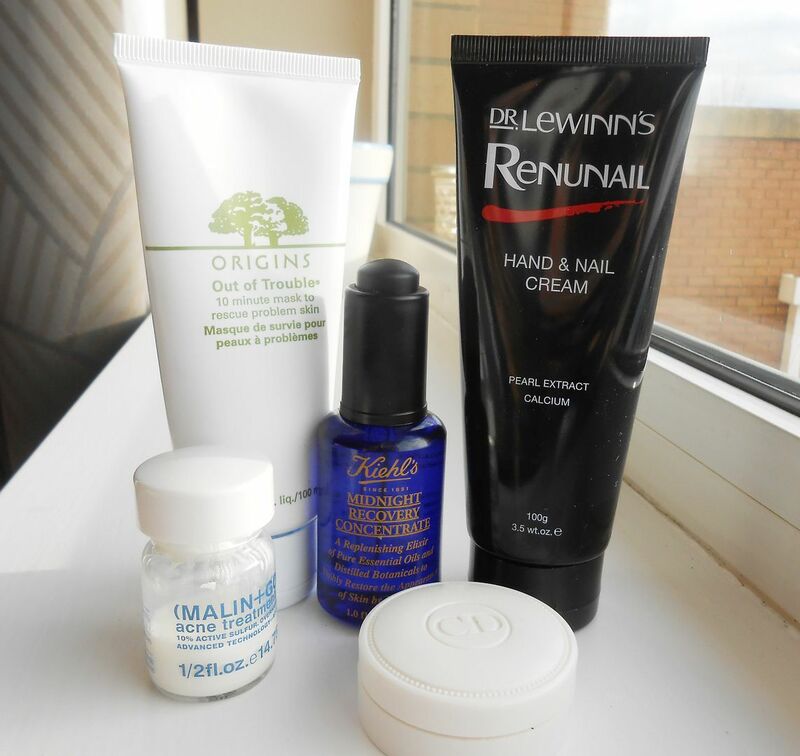 *reapplies* & lastly we have the Renunail hand & nail cream*. Before I go to sleep I always apply hand cream, because dry hands are… creepy? Ugh, they make me feel gross. This one is my current favourite, it claims to also improve nail condition which seems legit, but it is so so moisturising but v importantly, it sinks in quickly and leaves my hands less scaley. Maybe next week I’ll actually bother to put some makeup on? What have you been loving this week?